boldly variegated with cream, white or silvery striped veins. yellow, waxy bracts with tubular white, yellow or orange flowers protruding from each bract. 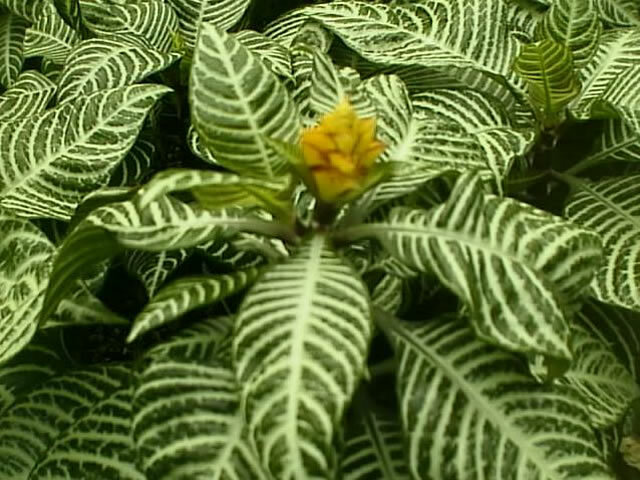 Even when they are out of bloom, Zebra Plants make very attractive, foliage house plants. but as a house plant they can easily be kept at 12"-18" by pruning. Zebra Plants are only hardy in zones 11 & 12. The rest of us will have to be content growing them as house plants. is to try to duplicate the same environment from which they originated. To be honest, it is pretty hard to replicate a Brazilian jungle without a greenhouse so you may want to consider buying your Zebra Plant and growing it as an annual just to enjoy it for a year or two of beauty. I'm not trying to discourage you from growing Zebra Plants. The requirements for growing Zebra Plants are much more rigid than with other house plants. Zebras resent any changes to their environment and will quickly drop their lower leaves if they are exposed to drafts, moved or repotted, or if the temperature or humidity level changes suddenly. Aphelandras should be grown in bright, indirect light but never in full or unfiltered sun. Zebra Plants require lots of moisture, and should never be allowed to dry out. to allow chlorine and other chemicals to dissipate. with moistened pebbles, or use a humidifier, especially during the winter months. Frequent misting will also help considerably. Wipe leaves often with a damp cloth to keep them glossy. and cooler in the winter, but never below 60°. with slightly cooler temperatures and reduced watering. or feed monthly from spring through summer using a half strength solution of a balanced liquid fertilizer. 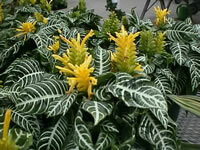 Zebra Plants can be cut back hard after flowering to control growth. Check regularly for spider mites and aphids. 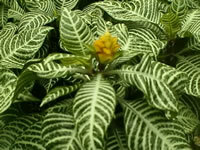 Zebra Plants bloom best when they are kept moderately root bound and should only be repotted to rejuvenate the soil in the spring. Use a porous, well-drained potting mixture with a high peat moss content. Potting mixes that have been blended for African Violets are ideal! Zebra plants can be propagated with stem tip cuttings of side shoots taken in the spring or summer. The tops of plants that have lost their lower leaves can also be cut off and rooted. Dust each cut with a rooting hormone and strike in a peat moss/perlite mix. Hold in a heated propagating case or a terrarium at 75°.